Now if you think about it for a moment or two, politics and homosexuality really do mix. Whilst one of them is a vocation that is full of queer folk. The other one generally likes dancing to ABBA and are normally called Julian. Yeah. I'm not pulling your leg. Cause I saw this combination in this 128 minute movie made in 2008. 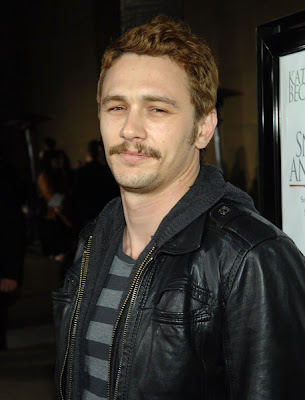 It was Directed by: Gus Van Sant; and Starred: Sean Penn, Josh Brolin, with James Franco. Hello. 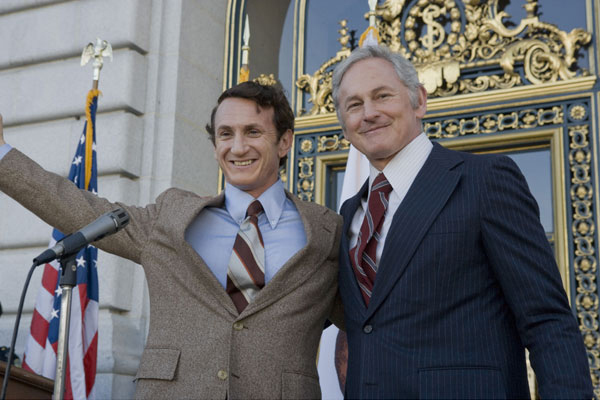 My name is Harvey Milk (Sean Penn). And I'm a forty year old homosexual who's recently moved to San Francisco with my partner, Scott Smith (James Franco), with the intent of starting our own business together. Well, we thought we were, anyway. Or otherwise I wouldn't have bothered to spend the time to set-up shop, and try to establish a gay community within this vicinity. And if I didn't do all that, I wouldn't have been able to run for governor, would I? Oh! Wait a minute. I'm getting slightly ahead of myself here, folks! So if I may back track slightly... ah-hum... one day, I heard the tragic news that a gay man had been killed on the city streets, and that the police didn't seem to be doing anything about it. That's when I took it upon myself to oppose this stance in a more official capacity. Year after year after year I relentlessly perused a governmental post, even though I was unable to achieve this due to low turnouts, opposing officials, and civil unrest. Plus on the home front things got slightly hectic as well, because my stern political focus pushed Scott away from me, eventually splitting up our close personal friendship. Thankfully, a few years later I somehow managed to turn all of this around. Not only because I found a new partner named Jack Lira (Diego Luna). But on top of that, I hired an astute campaign worker named Anne Kronenberg (Alison Pill), who helped me gain the supervisors post I've been fighting for, for all this time. Still. That's most probably why what next transpires all slides downhill again when I work with our new home town councilor, Dan White (Josh Brolin). As Proposition 6 wasn't very easy to achieve - my life at home isn't like Adam and Steve – ploys are posed tighter than a surgeon's knot – and at the end of the day, a life finally ends with a deafening gun shot. 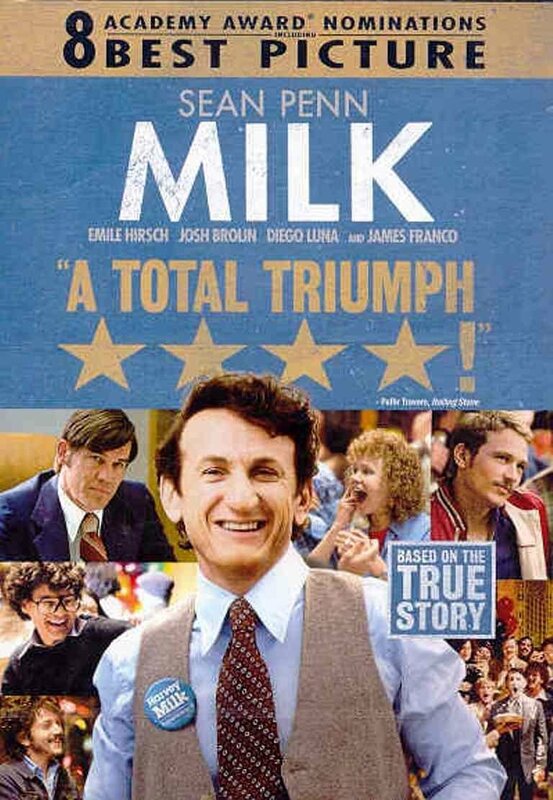 Now before I begin my review on 'Milk', I best mention that I never would have thought I'd enjoy a film involving a gay politician. Well, homosexuality isn't really 'my bag’ per-say. Not that I have anything against anyone who does of course. And as for politics on the other hand... err... again, this subject doesn't float my boat for very similar reasons. But having said all that, I was still taken back by this movie because on a cinematic level it reminded of two other great bio-pics -- ‘Mississippi Burning’ and ‘Malcolm X'. Except in this case the stance has nothing to do with race but rather sexuality. No difference on a conceptual level, huh? Because both of these subjects have always had a chequered place within recent history. Plus I have to say I did get right kick out of it for the following three reasons. For a start, I did enjoy how the stock footage and period attire were integrated into the narrative, just to hit home that this tale actually happened in real life. Secondly, the overall story flowed in a somewhat congenial manner, with merely two or three instances where the general plot-line appeared fractured on the screen. And finally, all the actors involved were just great to watch cause they managed to walk that fine line between being too campy or being too straight, to serve the actual tale it wanted to tell. Granted, there were a few segments of ‘Milk’ I wasn't too fond of myself. Such as any of those 'man on man intimate scenes’ for instance. However, these segments weren't so overtly blazé they took me out of the film completely. Instead, they made me shy a way for a moment or two, just long enough until all the ‘heavy petting’ was over and done with. Apart from that, though, I found this film very enjoyable, dear reader. As it informed me about a time and a man I wasn't very familiar with. It entertained me with a story that was both focused yet expansively intriguing. And it also presented with me a message that I thought was very poignant indeed, one relating to tolerance and acceptance of a continuously changing society. Good on you, Harvey Milk. I would like to dedicate this review in your honor, pal. This review plus the following filmic facts. (1) 'Focus Features' first screen this $20 million dollar production in San Francisco on the 28th of October, 2008, and eventually clawed back $54 million dollars at the box office. 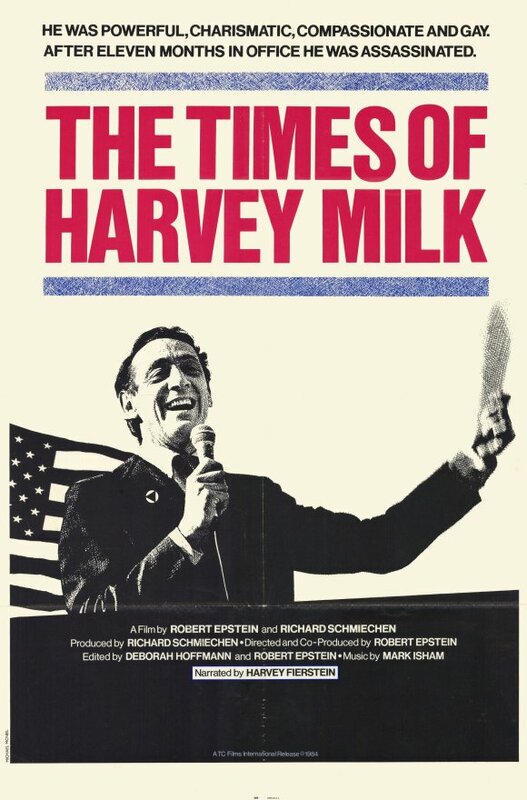 (2) During pre-production this project was entitled, 'Untitled Harvey Milk Project'. (3) At one time or another both Bradley Cooper and Chris Evans were considered for the role of Scott Smith. Where as for the role of Harvey Milk, you can add to the list: Robin Williams, James Woods, Al Pacino, Richard Gere, and Daniel Day-Lewis. (4) The majority of this movie was shot on location throughout the Californian state of San Francisco. This includes Atherton, Chinatown, Duboce Park, Forest Hill Station, Golden Gate Bridge, Market Street, Castro Street, Lower Haight Street, City Hall and the Federal Building, plus the Castro and the Excelsior District's. (5) The real Cleve Jones had a small cameo in the flick playing Don Amador. Whilst the real Carol Ruth Silver had a small cameo as Thelma. (6) Gus Van Sant, who was the director assigned to direct this movie, was involved with the making of it for over fifteen years. And once, during the early nineties, he was unsuccessful with an earlier version called 'The Mayor of Castro Street'. (7) This bio pic received eight Academy Award nominations in 2008 -- including Best Picture -- and won two for 'Best Actor in a Leading Role' for Sean Penn, and 'Best Original Screenplay' for Shawn Black. (8) After this flick danced around its handbag, Sean Penn starred in the drama, 'Fair Game'; James Franco starred in an episode of '30 Rock'; and Josh Brolin starred in the comedy, 'Women In Trouble'. Overall 'Milk' was a really good film and dealt with very engaging subject matter, despite being a bit kissy-kissy in places. Still. You can't win them all, can you? Or can you?